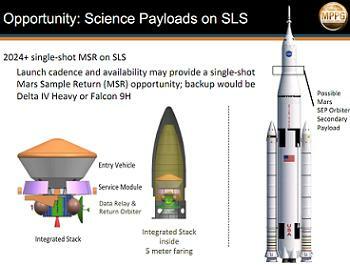 The Mars Program Planning Group (MPPG) have added meat to the bones of a proposal that would result in the Space Launch System (SLS), Orion and a Mars spacecraft making up the key elements of a Mars Sample Return (MSR) mission. With large support already communicated to lawmakers, the notional mission aims to utilize a secondary payload opportunity as early as SLS-5 in 2024. NASA’s wish to send as spacecraft to Mars, retrieve a sample and return it to Earth has fostered numerous proposals, all of which have failed to pass the planning stage. The most recent proposal was a joint effort with the European Space Agency (ESA) called ExoMars – to launch in 2018, ahead of returning the sample in the 2020-2022 time frame. However, NASA withdrew from the project this year, citing budget restrictions. The Russians also attempted a mission to return a sample back from the Martian moon of Phobos. 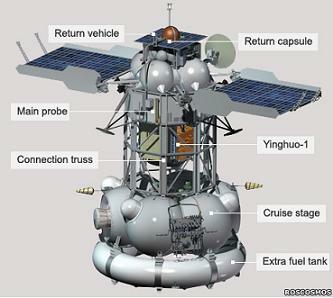 However, despite a nominal launch of the Fobus-Grunt spacecraft – also hosting China’s first Mars probe, Yinghuo-1 – the failure to perform the required orbit raising burns, along with subsequent communication problems, left the spacecraft stranded in Low Earth Orbit (LEO), prior to its re-entry and destruction. 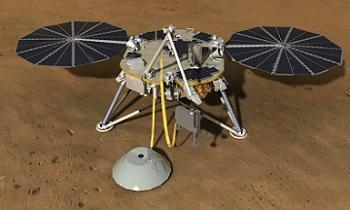 A proposal remains on the cards for a Mars-Grunt mission in the 2020s. However, given the very public failure of the Fobos-Grunt mission, it is unlikely the Russians have the appetite for pushing forward with this effort for at least the interim period. Meanwhile, the Chinese are still proudly over-promoting their space flight ambitions – if not the full specifics – including a path towards Mars. Their own effort to return a sample from Mars claims to focus on completing such a mission by 2030, at least according to officials in Beijing. While footsteps on the surface of Mars is the ultimate goal for all the space-faring nations, returning a sample from the Red Planet is a highly sought goal. Indeed, Louis Friedman – co-founder of The Planetary Society – once described the plans to return a Martian sample to Earth as the “Holy Grail” of robotic space missions. Along with the effort to build on the ongoing successes enjoyed by the Mars Rovers – not least the Mars Science Laboratory (MSL) team – the future goals of sample return and human deep space missions to the Red Planet were the subject of a full committee hearing in September. Largely positive support for the Space Launch System (SLS) – as a core “enabling” element of NASA’s exploration architecture – was received at the hearing, although it largely angled at promoting Mars science-related missions. With Mars headlined as the “ultimate goal”, Steven W. Squyres, Goldwin Smith Professor of Astronomy Cornell University spoke of his personal hopes for NASA’s aspirations on Mars, opening with remarks on the current goal of sending human missions to the Red Planet, led by the robotic “precursor” pathfinder missions. “I believe that the ultimate goal of NASA’s human exploration program should be Mars. As was done in the days prior to Apollo, robotic missions can and should serve as precursors to human exploration,” said Professor Squyres to the Senate’s Committee on Commerce, Science, and Transportation. The Professor then moved on to the subject of the Mars Sample Return (MSR) goal, noting how it was the highest priority in the Planetary Decadal Survey 2013-2022: “The Future of Planetary Science”, which he chaired. “This mission would be responsible for characterizing a landing site that has been selected for high science potential, and for collecting, documenting, and packaging samples for return to Earth,” he noted. “The Mars science community, in their inputs to the decadal survey, was emphatic in their view that a sample return mission is the logical next step in Mars exploration. 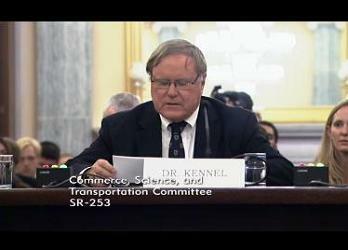 The Professor’s support for a Mars Sample Mission was backed up at the hearing by Charles F. Kennel, Ph.D – Professor of Atmospheric Science and Director Emeritus Scripps Institution of Oceanography University of California San Diego and Chair of the National Research Council’s Space Studies Board. “Many people believe that Mars is the ultimate goal for human exploration, and, indeed, the 2010 Act recognizes that a long term objective for human exploration of space should be the eventual international exploration of Mars. This fact alone makes it clear that NASA’s Mars science and human exploration programs have a powerful mutual interest in working together,” he told lawmakers. Referencing fellow panel member Professor Squyres, his support for a Mars Sample Return mission, along with the success of robotic missions on the Red Planet, Dr Kennel emphasized the need to roadmap the future, one that has a mission of allowing scientists on Earth to study actual materials from Mars. “His (Professor Squyres) committee’s report identifies the highest-priority mission being one that would begin the process of returning samples from Mars. Curiosity, because it has a long-lasting nuclear power source, could produce world-class science throughout the coming decade, but unfortunately there is now a question of what comes after that for Mars,” noted Dr Kennel. “The near future looks bright, but what will come after the launch of MAVEN (Mars Atmosphere and Volatile EvolutioN) in 2013 and (Interior Exploration using Seismic Investigations, Geodesy and Heat Transport) InSight in 2016? Recognizing the interest in enabling a MSR mission, the NASA Advisory Council (NAC) hosted a Mars Program Planning Group (MPPG) overview, dated November 14, that included a direct reference to a potential mission involving SLS and Orion. Although such a mission is nowhere to be found on any of the core documents relating to the ongoing Exploration Roadmap – be it the Design Reference Mission (DRM) content, or the expansive Concept Of Operations (CONOPS) presentations (all available on L2) – the lack of any defined missions outside of Exploration Missions 1 and 2 (EM-1 – EM-2) opens up the possibility of the MPPG outline being inserted into the overall plan. This possibility is raised at the very start of the presentation, where former Space Shuttle Program (SSP) manager John Shannon is listed as one of the MPPG core team members. 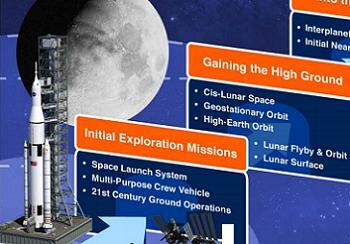 Mr Shannon is currently leading the SLS/Orion exploration roadmap effort. 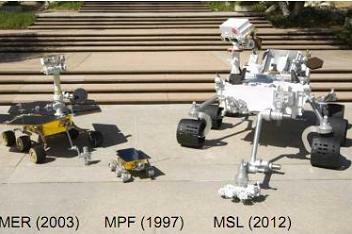 The final report’s “Bottom Line” notes the MPPG believe sample return architectures provide a promising intersection of objectives, all of which are focused on the search for past life on the planet – past the investigations already under way via MSL – all the while “bridging critical knowledge gaps” ahead of human exploration. With the presentation covering the required capabilities for a human mission to the Red Planet, classed as no sooner than 2033, a potential interim role for the hardware that will eventually be involved in a crewed mission to Mars is cited under the objective of a Mars Sample Return effort. Notably, such a use of SLS would not be its primary mission, with the “Possible Mars SEP (Solar Electric Power/Propulsion) Orbiter” riding as a secondary payload on the Heavy Lift Launch Vehicle. The cited alternatives of using a Falcon Heavy or a Delta IV-Heavy would see it become their primary payload. Based on a 2024 launch, the opportunity falls under the domain of SLS-5, should the current manifest remain unchanged. SLS-5 would be a Block 1A, 105mt capable launch vehicle, currently designated as the first use of the RS-25E main engines on the core stage – although that depends on the role of the current stock of RS-25Ds during the testing phase of SLS’ childhood. Moreover, the presentation associates this potential mission as one to involve Orion in the second leg of the mission, picking up the samples in space, with a heavy reference to the concern of planetary protection. 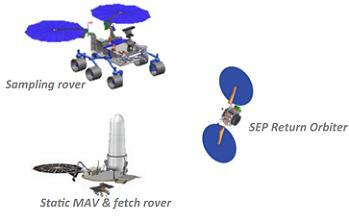 “Solar Electric Power-enabled robotic vehicle delivers samples to Beyond Earth Orbit (BEO) for crew-based retrieval,” the presentation adds, without specifics as to where such a rendezvous would take place. “Sample canister could be captured, inspected, encased and retrieved tele-robotically. Robot brings sample back and rendezvous with a crew vehicle. Cleaned sample canister would be then enclosed in a stowage case and stowed in Orion for Earth return. “This approach deals with key planetary protection concerns. Crew inspection, cleaning and sample prior to Earth return removes the need to robotically “break the chain” of contact with samples at Mars, thus reducing complexity and cost of the robotic missions. The presentation notes Orion’s crew entry system eliminates need for robotic Earth entry system. It also adds that such a mission would provide an early opportunity for collaboration and demonstration of capability also applicable in Mars orbit, potentially pointing to the sample – lofted off the Martian surface by a Mars Ascent Vehicle (MAV) – being captured by an Orion expedition conducting an EM-2 style mission, this time in Mars orbit. It may also involve the highly popular Gateway located at EML2. Such a mission will likely remain notional for some time, with even the basics of the overall roadmap for SLS and Orion still awaiting official release.